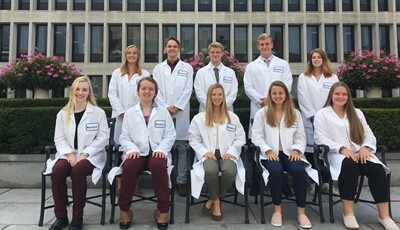 Students in the New Visions Health Care Program spend their senior year at Bassett Medical Center in Cooperstown and Fox Hospital in Oneonta. This full-day program immerses students in the medical environment through a rotation schedule that places them in 25 hospital departments. They work side by side with doctors, therapists, technicians and nurses as they explore career options. They receive evaluations and references from the professionals who are their mentors. They also accrue clinical hours required by some professional programs. In addition, students study English 12, Economics, Participation in Government, Physics and Human Anatomy and Physiology. They learn professional behavior, organization and independence while working to a high academic standard.